Description Features: New Analog Replacement Switch for Sony PS2 Microsoft Xbox 360 Controller This is a direct high quality replacement for the xbox 360 controller This analog is exact spec as the original one on the Microsoft controller The switch pinout and shaft size is the same. Description: Features: New Analog Replacement Switch for Sony PS2 Microsoft Xbox 360 Controller This is a direct high quality replacement for the xbox 360 controller This analog is exact spec as the original one on the Microsoft controller The switch pinout and shaft size is the same. · Xbox 360 DVD Drive Power SATA Connector Cables. Xbox 360 DVD Rom Drive. 1 x Power SATA Data Ribbon Cable Cord Set for. 1x Shell Case with Complete Spare Button Parts. Color: White. Included front and rear plates sets and button parts kits. (as picture shows). 1x Shell Case with Complete Spare Button Parts. Color: Blue. DG-16D5S DVD ROM Hard Disk Drive Board Replacement for XBOX 360 XBOX360 Slim New Features: Original and brand new Model:DG-16D5S Compatible Model:Xbox360 Color :as pictures shown Weight:530g/18.69ounce Packing include: 1pcs Original XBOX360 SLIM DG-16D5S DVD ROM Drive Brand Unbranded/Generic MPN Does Not Apply EAN Does not apply Model For XBOX 360 XBOX360 Slim To Fit Console Type Disc Drive. Material: PVC electronic components. Applicable to: For Xbox360. We will always here to solve them for you. It won't help the problem to be solved. Suitable for Xbox 360 consoles. - 25 Pin 141x Flex Ribbon Cable. 1 Piece Flex Cable. Just buy it! Don't just think about it! 10 x Analog Joysticks. Note: Due to the light and screen setting difference, the item's color may be slightly different from the pictures. 1Piece Mod Chip. - Tighter circuit layout to give cleaner signal performance. - HQ electric component. - No more solder bridges required. Specially designed for Xbox 360. Color: black. 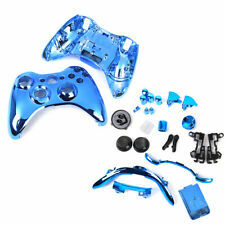 1Set Buttons Kit FOR Xbox 360. - 1 x LB RB Insert. - 1 x Bottom Insert. - Easy to install. This item: Was£2.17 x 10 Price:£1.78 x 10. Price for all:17.77 You save3.93. - 2 x Thumbsticks. - 1 x D-PADS/Directional PAD. 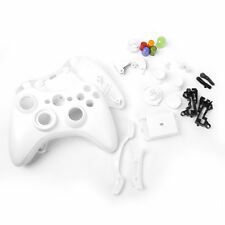 1 x for Xbox 360 Triggers Buttons Kit Set. - 1 x LB RB Insert. - 1 x Bottom Insert. - Easy to install. - 1 x X Button. - 1 x B Button. - 1 x A Button. - 2 x Thumbsticks. Applicable for Microsoft XBOX360. 1 Piece Cable. Material: plastic; Size: Approx. Color: Golden. 1x Shell Case with Complete Spare Button Parts. 1 Piece PCB 9504 Unlocked Board for Xbox 360 Slim. - Perfect for Xbox 360 slim, effectively improve effectiveness. Do not lock the PCB. - Model for XBOX 360 Slim. People always bought together with. Descriptions: Whether you've stripped out some screws or your so-called friend dropped one during an install, fear no more! Your Xbox 360 can be whole again and just as sturdy as before. - Including all screws needed for the case, the motherboard, the Power board, and the heatsinks. Applicable for Microsoft XBOX360. 1 Piece Cable. Material: plastic; Size: Approx. A 3-year warranty is promised, your satisfying is our ultimate pursue. 2 Sets Housing Shell Case with Complete Button Mod Kit. - Included front and rear plates sets and button parts kits. (as picture shows). - Material: Plastic. Due to the difference between different monitors, the picture may not reflect the actual color of the item. Features: Original and brand new Model:DG-16D5S Compatible Model:Xbox360 Color :as pictures shown Weight:530g/18.69ounce Packing include: 1pcs Original XBOX360 SLIM DG-16D5S DVD ROM Drive Brand Unbranded/Generic Type Disc Drive MPN Does Not Apply Platform for XBOX 360 XBOX360 Slim Model DG-16D5S To Fit Console Country/Region of Manufacture China EAN Does not apply. Squirt DUAL NAND PCB 512MB PCB chip for Xbox 360. - NAND PCB is compatible with any RGH chip. - NAND 512MB on board. 1 Piece Dual NAND PCB for Xbox 360. - Material: PCB Board. - Two ZIF connectors, support other modchip (progskeet etc.). 1x Shell Case with Complete Spare Button Parts. Color: Red. Included front and rear plates sets and button parts kits. (as picture shows).